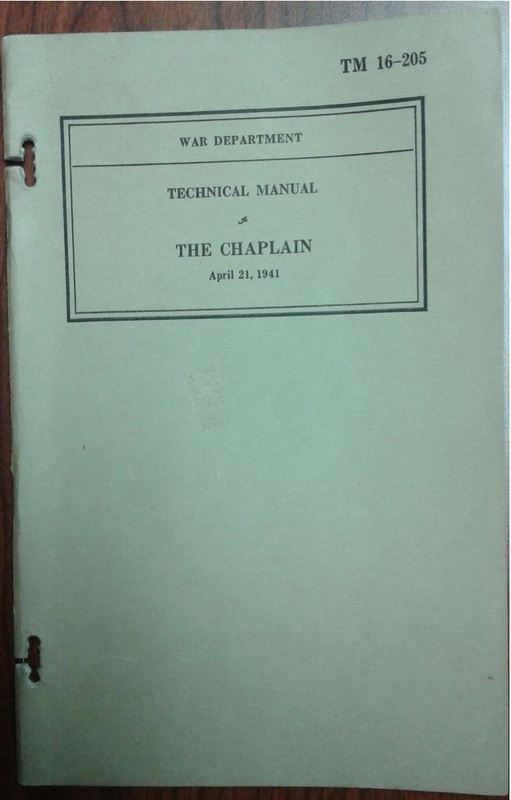 The official The Chaplain’s Manual was issued in 1927 and again in 1937 and 1941. It was rewritten in 1944 by a Reserve chaplain with the idea that it would be better understood by chaplains just entering the military from civilian life or Reserve chaplains serving in both worlds (Honeywell 1958, 251). As the United States was entering World War I, the main way new chaplains received any sort of training was by making their first assignment in the office or at a post of a more experienced chaplain who would take time to provide additional training and mentorship for those assigned to his care. However, this barely provided sufficient indoctrination into military ministry and there was little standardization in training topics from chaplain to chaplain or post to post (Honeywell 1958, 203). 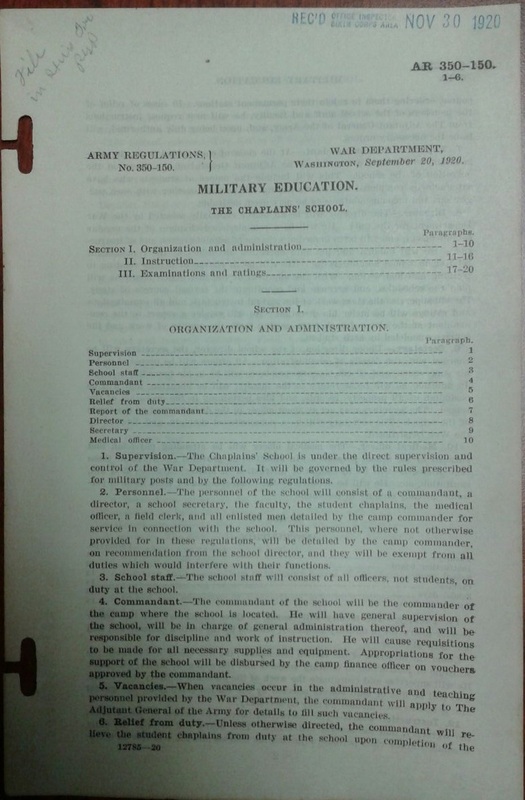 The development of a Chaplain School for the Army came as a response to the need for chaplains during war. Before World War One, the training a chaplain had would have been gained before entry into the military, so primarily civilian education for ordained ministry, though General John J. Pershing, commander of the American Expeditionary Force, did recommend that they be “accustomed to dealing with young men” (Honeywell 1958, 170-171). More than that, newly appointed chaplains needed specific training to better understand “the structure and functioning of the military organization and with the methods of performing their professional duties most successfully” so as to “prepare them for efficient service as part of the military organization” (Honeywell 1958, 172). The benefit of the short school in France over the longer school in the United States was that it included more emphasis on ministry in battlefield conditions. Classes being taught by those having experienced war in the trenches helped the newly arrived chaplains be better prepared for what they would face in combat. serve men of other denominations, train them as Army officers so that they could mingle with others on an impartial level, save them from embarrassing blunders by teaching them Army regulations and customs, prepare them to serve as defense counsel through an acquaintance with military law, give them the benefits to be derived from the experience of older chaplains and the fellowship of men of different faiths, help to rid individuals of mannerisms and defects and to standardize activities on a high level, and give chaplains an appreciation of the military institution and its history (Honeywell 1958, 204). With those recommendations, the first permanent Chaplain School following World War One opened on 15 May 1920 at Camp Grant in Illinois. Attendance in the basic course at the new school was open to any chaplain commissioned since 1913, but only those who had not attended one of the courses during World War One. 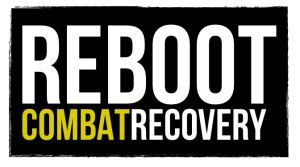 This new course had a total of 280 hours of instruction, mainly military-related topics but also those related to the chaplains’ work and physical fitness. The course was expanded to six months in 1922 then began decreasing, first to about three months then finally down to less than six weeks (Honeywell 1958, 204). After the first two sessions at Camp Grant, the school moved to Camp Knox, Kentucky in 1921. After only two more courses, the school moved to Fort Wayne Michigan in 1922 then after three sessions to Fort Leavenworth, Kansas for five more classes where because of such low attendance that some recommended the school be closed unless regular enrollment could be increased. Unable to produce more students, there were only eleven classes offered between the World Wars with a total of only 189 chaplains attending (Honeywell 1958, 205). There were a few years when, by special arrangement, the Chief of Chaplains was able to send a few potential chaplains per year to the University of Chicago and the Catholic University of America but it was soon discontinued, the new Chief believing chaplains should experience military ministry before perusing more higher education. So, initial training for new chaplains began again, first at Fort Sheridan, Illinois then at Fort Meade, Maryland. At these posts, seminarians would spend time under the tutelage of senior chaplains and begin to gain an understanding of how the Army operates and the uniqueness of military ministry. Many of those included in this program were chaplains taking advantage of the program and additional training under senior chaplains. It was difficult for Reserve chaplains to take advantage of, however, because of their full-time employment responsibilities but realizing that chaplains could not be prepared, efficient and proficient chaplains, a minimum training standard was established which led to the majority of Reserve chaplains being trained by a correspondence course developed in 1924 by the Chaplain School. This course included studies in “Practical Duties of Chaplains, American Political Institutions, Military Sociology, and six common subcourses prepared by other branches.” More correspondence courses for different ranks of chaplains, in addition to recommended reading for chaplains to be promoted were recommend and in some cases required (Honeywell 1958, 206-207). With the influx of new chaplains for duty in World War Two, a permanent Chaplain School was again established at Fort Benjamin Harrison, Indiana 2 February 1942 but was almost immediately insufficient for the number of chaplains that needed training. There not being an Army post with sufficient space to house the Chaplain School, in August 1942, it took up residence at Harvard University in Massachusetts, where, serendipitously, chaplains could experience the history and tradition of military service Harvard’s leaders and students were part of. In 1944, as attendance began to decrease, the school could be housed at Fort Devens, also in Massachusetts, which “made possible such realistic training as ship-to-shore landing and the passage of an infiltration course,” though in July 1945, it moved to Fort Oglethorpe, Georgia where it remained for a little over a year (Honeywell 1958, 244). Much of the coursework during the World War Two years focused on the chaplain’s personal well-being. “Calisthenics, drill, road marches, and similar exercises are designed to give him the physical vigor and endurance which will enable him to go with his men wherever they may be sent and to perform his duties under any condition or difficulty” (The Chaplain Serves 1944, 29). The course during World War Two began as only four weeks long but had increased to five then six weeks by the time the war ended. 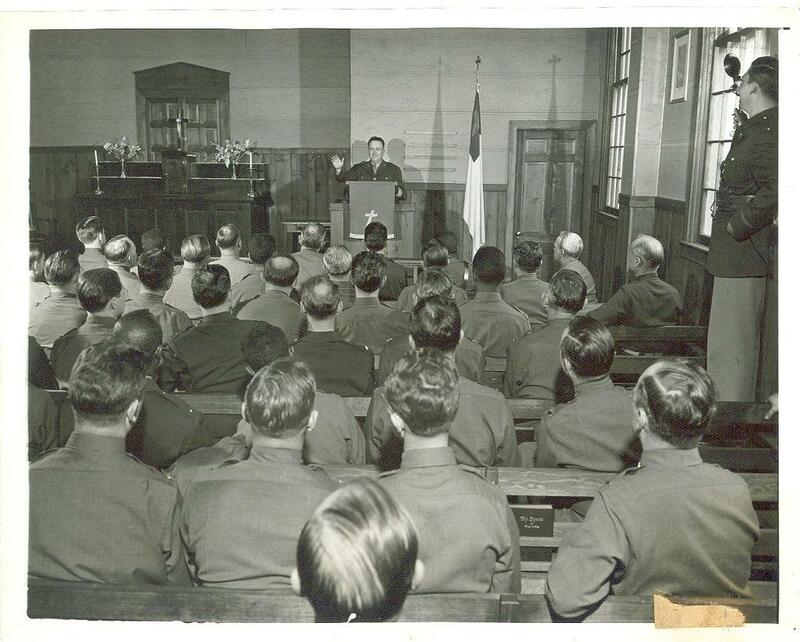 In all, from the Chaplain School’s reestablishment at Fort Benjamin Harrison in 1942 to the time the school was reorganized in January 1946, thirty-five sessions in all were held with 8,183 chaplains graduating of the 8,302 enrolled. However, some of the chaplains who failed the course due to academic deficiency were still ordered on to units, because of the great need for chaplains during the war years. Fortunately, later evaluation revealed that these chaplains, for the most part, served well and in many cases exceptionally (Honeywell 1958, 249). Webster, Harry W. Sawdust Trail Chaplain. Lafayette, CA: Harry W. Webster, 1985. The Chaplain Serves. Washington, D.C.: Office, Chief of Chaplains , 1944.